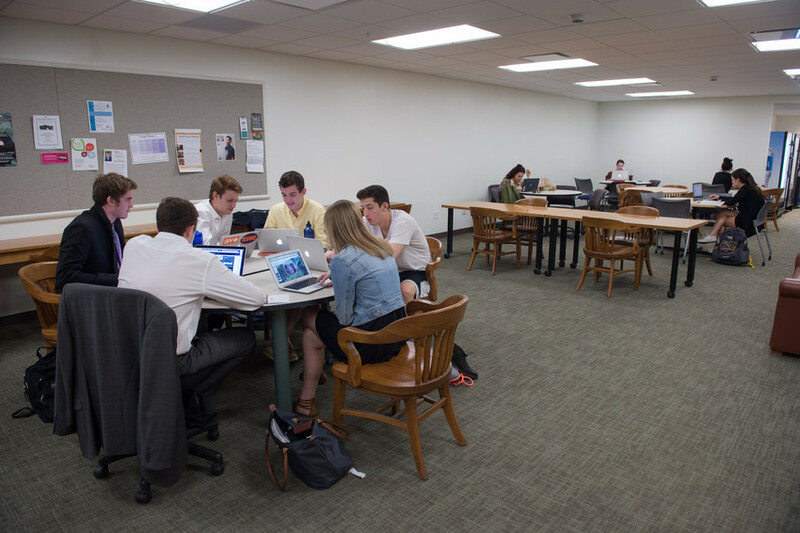 Students in the David B. Falk College of Sport and Human Dynamics work on class projects in one of the new student spaces inside the new Falk Complex in MacNaughton and White halls. Within hours of the opening of a student lounge—one of several community spaces—in the new Falk Complex earlier this semester, students were making it their own. They’ve been making it their home. Students, along with faculty and staff, are settling in to the new site of the David B. Falk College of Sport and Human Dynamics in the Falk Complex at MacNaughton and White halls, which formerly housed the College of Law. Public health and nutrition major Aziza Mustefa ’15 appreciates how the new complex is bringing together students from the various disciplines. This is the first time all the college’s disciplines will be in one location—“so it is the big coming home,” Dean Murphy says. The central administration offices had previously been housed at 119 Euclid Ave., so that had been the centralized location for many gatherings, while the various departments had sites across campus. The transition to move the various departments and administrative offices began over Winter Break and continues into the fall as the renovations wrap up. 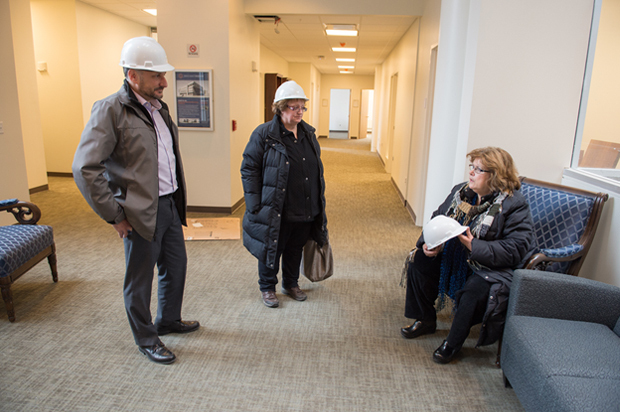 Falk College Dean Diane Lyden Murphy (right) discusses the renovations of the new Falk Complex with Chris Danek (left), of the University’s Office of Campus Planning, Design and Construction, and Dianne Seeley, the college’s senior administrator of operations, space and facilities, during a tour in January. The new centralized location allows faculty members to have more impromptu “watercooler conversations,” visits in the hallways and additional opportunities for inspired collaboration. The new community spaces in the Falk Complex have expanded those opportunities for faculty in the various disciplines to be engaged with each other. It’s those types of ideas that went into more than three years of planning for the convergence of Falk College’s five academic departments and its administrative offices. Surveys were done with students, faculty and staff to help understand what the needs were and what could be included within the budget. Plans were developed through the Office of Campus Planning, Design and Construction, project architect Ashley McGraw and design partner Gilbert Displays. “We studied the building and then we figured out the spaces with the various department chairs,” Dean Murphy says. Each academic unit has an office with the department chair, graduate and undergraduate studies directors, and administrative assistants. Faculty members are assigned nearby offices. In January, the move included the Office of the Dean, admissions, advancement, the college’s information technology office, the Department of Child and Family Studies, Public Health and the School of Social Work. In March, the Office of Student Services was set up. The first move in January involved transferring the spaces for 94 people, with 5,169 boxes transferred in a day and a half by the movers, according to Dianne Seeley, Falk College’s senior administrator of operations, space and facilities, who has been part of the renovation process and has overseen the moving. Four hundred computers were also set up by informational technology staff members in five days. Lisa Olson-Gugerty, an instructor in public health, unpacks her materials in her new office in the Falk Complex in January. This month, the Department of Sport Management and the College Research Center will be moved into their new spaces. Throughout the summer and into the fall, the food studies and nutrition programs, will make the move, which includes reconstruction of the fifth floor for the commercial and experiential kitchens. The Nutrition Science and Dietetics Program will also have a new nutrition assessment lab, where they will examine the nutrients in food. The lab will be finished this summer. Additionally, the commercial kitchens and teaching kitchens, along with a multipurpose teaching café/classroom, will be moving in and built up through late August and finished in early fall. The kitchens will offer a state-of-the-art learning facility with technology and kitchen equipment. The kitchen and café/classroom will support the academic programs of nutrition and food studies. For the Department of Sport Management, a new lab will teach the technology of sports and events operations. There will also be a ticketing classroom with associated technology to learn about ticketing for large sports facilities. This will also include a business arrangement with the Carrier Dome to allow students to be hired and assist in ticketing. Along with the various departments, the Falk Complex has three computer labs and a Mac lab, which is new for the college. Other renovations have included technology upgrades to many classrooms, along with new carpeting, paint and signage. “We now have a showpiece, an extraordinary learning environment serving all our academic degrees. Everybody feels lifted coming in the front door,” Murphy says. A grand opening of the new Falk Complex is planned for September.